Explosions have hit Brussels airport and a main metro station, Belgian officials say, and, according to news reports and the transit agency, at least 26 people have been killed. 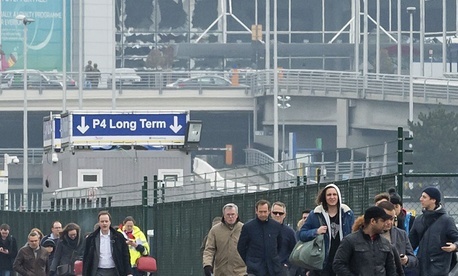 There were two explosions at Zaventem airport at about 8 a.m. local time (3 a.m. ET) near the check-in desks at the departure terminal. VTM, a Belgian broadcaster, reported at least 11 people were killed at the airport. VRT, another broadcaster, put the toll at the airport at 14 people killed. STIB-MIVB, the Brussels Metro operator, said 15 people were killed at Maelbeek and 55 wounded. But Yvan Mayeur, the Brussels mayor, told a news conference that at least 20 people had been killed at the station, but it is “too early to say exactly what the number of victims will be.” More than 100 people were injured there, he said. The numbers are provisional and are likely to change. Michel said the airport explosion was caused by a suicide bomber. At the news conference, Fredere Van Leeuw, the Belgian federal prosecutor, said the explosions were terrorist attacks. No one has claimed responsibility for the attacks, but as my colleague David Graham has previously noted, Belgium has become Europe’s hub for Islamist radicals. In response, Zaventem airport was closed, as was all of the city’s public transportation, and main train stations. Belgium raised its terror-threat level from three to four, the maximum level, and Van Leeuw’s office said federal prosecutor’s anti-terrorism unit has opened a criminal investigation into the explosions. Additionally, the prime minister asked residents of Brussels were asked to stay in place. Steve Clemons, the editor of Atlantic Live, was in Brussels at the time of the attacks, and has been tweeting his observations—and interviewing witnesses—as he leaves the city for Amsterdam. Cities across Europe tightened security in the wake of the attacks. In Britain and in France, officials deployed thousands more police across cities. “As a precaution forces across the UK have increased policing presence at key locations, including transports hubs, to protect the public, and provide reassurance,” said Mark Rowley, the top British metropolitan police officer in charge of special operations. Britain was on alert for a follow-up attack, and left its terrorism warning level at severe, deeming London one of the most likely areas for potential attack. Rowley said the additional officers will “carry out highly visible patrols” around the city and its transport system to deter a follow up. France deployed an additional 1,600 officers to reinforce security at its borders. Interior Minister Bernard Cazeneuve said another 400 officers will patrol Paris, and military will guard public transport areas. French President Francois Hollande, who just days ago had reveled in the capture in Belgium of the man who planned the Paris attacks last November, said Tuesday that though the attack was on Brussels, all of Europe had been hit. Anne Hidalgo, the Paris mayor, said the Eiffel Tower would be illuminated Tuesday night with the Belgian flag. The U.S. Embassy in Brussels asked American citizens to shelter in place and avoid public transportation. Senator Ted Cruz, Trump’s main rival on the Republican side, reacted in a similar fashion. John Kasich, the Ohio governor and Republican presidential candidate, said hewas “sickened” by the news. Tuesday’s attacks come four days after the capture of Salah Abdeslam, the accused logistical planner of the Paris attacks, in Brussels. Belgium’s capital has been on edge since the November 15, 2015, attack that killed 130 people in Paris, an operation organized by the Islamic State on Belgian soil. Belgian officials warned their country’s citizens of a serious, imminent threat of terrorism, and later cancelled the New Year’s Eve fireworks in the capital. Those fears now appear realized.